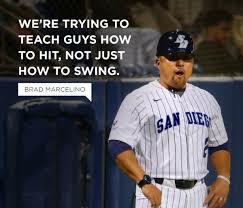 For the past 7 years Brad Marcelino was at The University of San Diego as the hitting coach and recruiting coordinator. His responsibilities also include base running, defense and in the past have included strength and speed training. Coach Marcelino has coached numerous MLB draft picks throughout his coaching career as well as the younger generation. 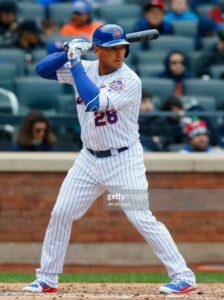 Marcelino Baseball will teach the same principles and fundamentals that have allowed numerous players to be successful under his tutelage. Our plan for development and peak performance will be focused on details and executing fundamentals that will allow the player to grow with the process. Come learn the Marcelino Baseball Way that has lead to numerous high school kids moving on to the collegiate level and 5 consecutive Top 100 MLB draft picks! Marcelino Baseball Academy is coming back to North County SD for our now famous and annual sold out 4 day offense camp with former USD Hitting Coach and Recruiting Coordinator Brad Marcelino. Coach Marcelino is contracted by MLB players (see testimonial page) and organizations to help players develop into complete offensive players. Last summer this camp did sell out! Due to the high level instruction/coaches this camp sells out every winter/summer while also being priced around $15/hr - please remember we CANNOT hold spots and once the camp roster is full online registration will close. Learn skills from college coaches, college players, professional players that want to see you leaving camp as an improved player! Complete Offensive Player: Base Running, Bunting, Approach, Off speed Hitting, etc. From 2012 - 2018 Coach Marcelino's offenses have lead the nation and conference in numerous offensive categories. Learn his hitting program, drills, terminology, check points, fundamentals, that have helped his players continually become some of the best position players in the nation and consistent top round MLB draft picks. Expand your game by learning how to execute various skills that will take your offensive game to the next level. Learn not only how to hit the baseball correctly but learn other offensive skills that will make you an all-around better offensive player. We will review: base running, sliding correctly, bunting, approach, pitchers tendencies, off speed hitting, hitting plus velocity, etc. Learn the mental game of baseball that allows players to be consistent, control emotions, be detailed with the process and not letting the situation dictate performance. Learn our system to perform under high pressure situations and how to manage frustration with specific steps from our team sports performance coaches. This includes leaving with an a routine to prepare to hit not only in the dugout but on deck and before you step into the batters box. Go through our stretch/flexibility routine and speed/agility training that we incorporate with our players on a weekly basis. These movements that we teach when performed consistently will allow you to perform at a much faster, more explosive pace while maintaining body control. The primary focus of this camp is offense but we will teach one of the most important parts of the game for young players - arm care. Learn the correct way to perform arm care, arm strengthening and throwing program. Regardless of your skill level we can accommodate you at camp because you will be grouped with campers your same age/skill level. All campers can be assured of an equal amount of playing time during regularly scheduled camp scrimmages with teammates of their age and skill level. The coaching staff provides positive encouragement We will teach each camper a skill set so they are a better all-around player. Check-in: Camper Registration and Check-in 8:30am. Meals: Lunch not provided - bring own lunch and snacks for the day. $75.00 cancellation fee for ALL cancellations made at least two weeks prior to the first day of camp. If cancellation, for any reason including medical, is made within two weeks of the camp, there is a $150 cancellation fee. All cancellations must be submitted in writing prior to the first day of camp. No refunds will be given upon expulsion, voluntary withdrawal from camp or weather. No credit will be issued. Weather: No refunds will be given for inclement weather unless 75% or more of the camp is cancelled. 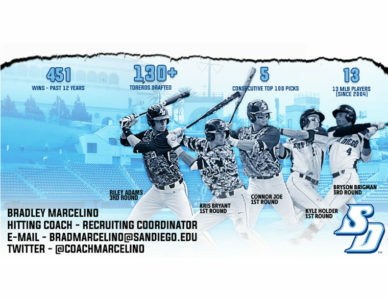 Marcelino Baseball Academy is coming back to North County SD for our now famous and annual sold out 4 day offense camp with former USD Hitting Coach and Recruiting Coordinator Brad Marcelino. He has coached among others 5 consecutive high draft picks: Kris Bryant (1st round #2 overall) 13, Connor Joe (1st round 39th overall) 14, Kyle Holder (1st round 30th overall) 15, Bryson Brigman (3rd round 87th pick overall) 16, Riley Adams (3rd round - 99th pick overall) - '17. The 2017 Toreros were again a division 1 national offensive leader with 55 home runs and ranked in the top 20 nationally in doubles. The 2018 Toreros were #1 in the West Coast Conference in hits and other offensive categories and ranked 22nd in the nation in hits. Due to the high level instruction/coaches this camp sells out every winter while also being priced around $10/hr - please remember we CANNOT hold spots and once the camp roster is full online registration will close. This camp will primarily be focused on offense plus instruction on arm care, arm strengthening and throwing program. Complete Offensive Player: Base Running, Bunting, Approach, Offspeed Hitting, etc. Camper Registration and Check-in 8:30am. Lunch not provided - bring own lunch and snacks for the day. Marcelino Baseball Academy - North County Winter Hitting Camp ... 85% Full! Due to the high level instruction/coaches this camp sells out every winter while also being priced around $11/hr - please remember we CANNOT hold spots and once the camp roster is full online registration will close. COME JOIN FORMER DIVISION 1 RECRUITING COORDINATOR AND CURRENT NEW YORK MET/MLB PLAYER PHILLIP EVANS FOR A HIGH LEVEL 3 DAY BASEBALL CAMP FOR 8TH 12TH GRADE AND LIMITED TO THE FIRST 50 KIDS. HITTING SYSTEM: Learn Coach Marcelino's Hitting System that has produced 5 consecutive top 100 MLB draft picks, numerous NCAA team offensive national rankings and current MLB player Phillip Evans approach that helped him win a batting title. HIGH LEVEL DEFENSE: Learn how to defend the MLB way - MLB player Phillip Evans is known as a high level defender at multiple positions! COMPLETE OFFENSIVE PLAYER: Approach, On Deck routine, Baserunning, bunting, hunting speeds and heights, situational hitting, etc. Come and join former DIVISION 1 RECRUITING COORDINATOR AND CURRENT NEW YORK MET/MLB PLAYER PHILLIP EVANS for a high level 3 day baseball camp for 8th 12th Grade and limited to the first 50 kids. Learn how to navigate the college recruiting landscape and implement elite swing movement patterns as part of your foundation with MLB/Division 1 level information. Add in high level defense from New York Yankees 1strounder and best defensive shortstop in all of minor leagues Kyle Holder. THIS IS A CAMP YOU CANNOT MISS! Per NCAA rules this camp is open to any and all participants. No college coaches that are not permitted to attend will be attending camp per dead period. HITTING SYSTEM: Come and learn the elite swing movement patterns that are taught at the Professional and Division 1 level from former hitting coach and recruiting coordinator at The University of San Diego and current MLB player Phillip Evans! Phillip Evans has won a batting title and has performed versus the best in the world. NAVIGATING THE RECRUITING WORLD: The recruiting mystery! Come and listen to a crash course on how to start, plan, and execute a college path to moving on to the next level from a Division 1 recruiting coordinator. Learn the information that no one wants to be truthful about. Parents are highly encouraged to attend this. How do I qualify to get more scholarship money? Where do I start? How do I get recruited? What should I write in my emails? Do I need a prospect video? What showcases should I go to? What do college recruiting coordinators look for? What grades do I need to get? What financial help is out there? HIGH LEVEL DEFENSE: Learn how to defend the MLB way - MLB player Phillip Evans is known as a high level defender at multiple positions! We will also have high level defense from other professional players including New York Yankees 1st rounder and #1 ranked best defensive shortstop in all of minor leagues Kyle Holder. According to MLB Pipelines Jim Callis: I havent had more people rave about a prospects defensive prowess to me since the days of Omar Vizquel coming up with Seattle. THIS IS A CAMP YOU CANNOT MISS! Due to the demand we are now going to be running a Spring Break Camp! Marcelino Baseball Academy is coming back to North County SD for our now famous and routinely sold out 4 day offense camp with former Division 1 Hitting Coach and Recruiting Coordinator Brad Marcelino. Coach Marcelino is contracted by MLB players (see testimonial page) and organizations to help players develop into complete offensive players. Regardless of your skill level we can accommodate you at camp because you will be grouped with campers your same age/skill level. All campers can be assured of an equal amount of playing time during regularly scheduled camp scrimmages with teammates of their age and skill level. We will teach each camper a skill set so they leave camp as a better all-around player with drills/routines to be able to continue at home. The MB coaching staff provides positive encouragement to all campers so they leave with a greater passion for this game! Due to the high level instruction/coaches this camp sells out every year while also being priced around $15/hr please remember we CANNOT hold spots and once the camp roster is full online registration will close. Equipment: Each camper must bring his own baseball equipment. Players should bring a glove, bat, batting gloves, helmet, cleats/spikes, running shoes or turf shoes, hat, and any other equipment they feel necessary to compete. Please mark campers names on all items. The camp is not responsible for lost belongings. Cancellation Policy: $75.00 cancellation fee for ALL cancellations made at least two weeks prior to the first day of camp.